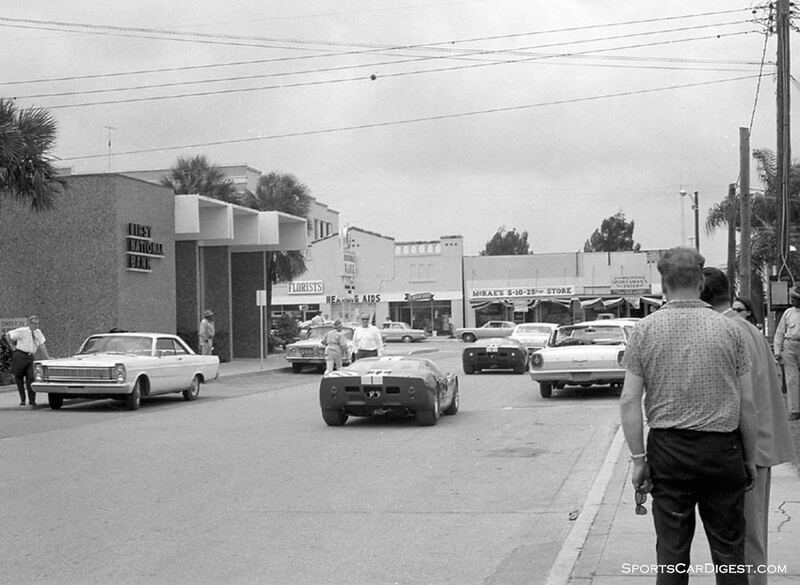 Whether driver, crew member, race official or spectator, no one who attended the 1965 running of the 12 Hours of Sebring will ever forget that race. A record crowd of over 50,000 race fans came expecting a race to remember, and the foremost sports car race in this country didn’t disappoint them. The drama that ensued both on the track and off became the stuff of legends and is still talked about and written about today. This was the era known at the Golden Age of Sports Car Endurance Racing where it was customary that the majority of the cars on the grid would be owned and piloted by what was referred to as “privateers” or gentlemen (and sometimes lady) racers. These privateers and their cars were very different from today’s drivers and race cars because what you saw on the track and in the pits back then were entrants without the ubiquitous patches, logos and graphics that make today’s race cars and drivers look like moving billboards. It was a simpler time, and perhaps, a better time. 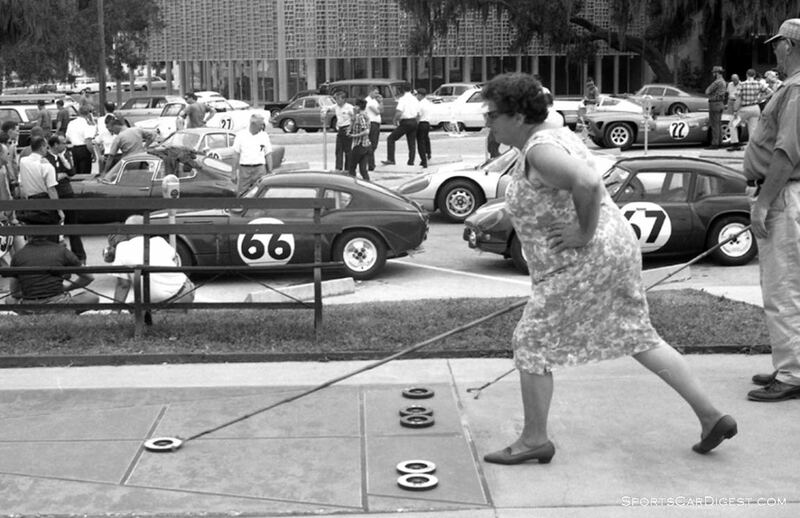 The 1965 Sebring race was not without a bit of controversy even before the starting flag fell. The previous year the U.S. representatives to the sanctioning body for sports car endurance racing (FIA) had convinced that body to repeal its engine size limit of 3000cc’s on prototype cars and allow the creation of an unrestricted sports car category. Alec Ulmann, the creator and promoter of the 12-hour race, also worked a little magic and got the competition arm of FIA, known as CSI, to allow both prototype cars and large-displacement sports cars to race in the same event (Sebring in particular) even though their own regulations prohibited this. These changes went into effect in January of 1965. 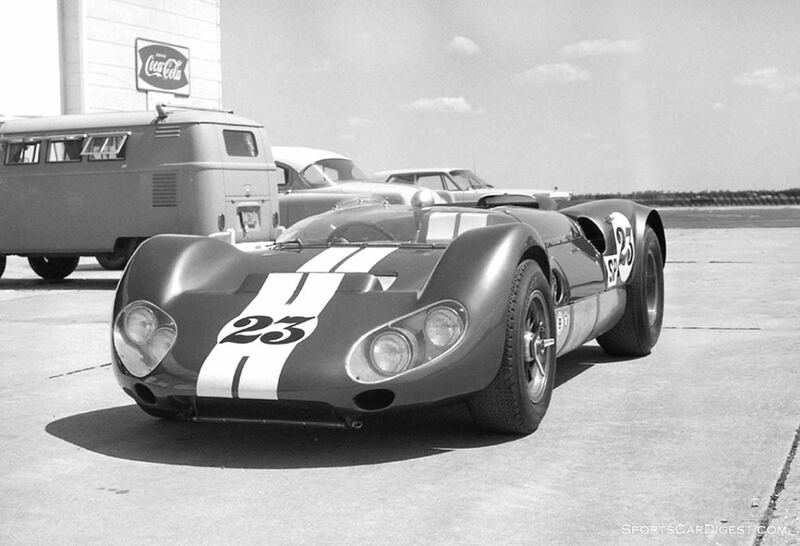 Knowing that these rules changes would allow the popular big-block American sports cars to compete against the best that Europe had to offer, Mr. Ulmann decided to invite Texas oilman Jim Hall to enter his race-winning, Chevrolet powered Chaparral cars to the 12 Hours of Sebring. Ulmann’s decision to invite the Chaparral team was predicated on the belief that American sports car fans, as well as the media, would flock to Sebring to see Chevy, Ford, and Ferrari duke it out to see who was top dog in the world of endurance racing. He wanted those extra gate receipts and prestige that such a match up would bring and as history shows us he got what he was asking for and then some. The Chaparrals were equipped with a 5.4-liter aluminum-block Chevrolet engines and an unorthodox “secret” automatic transmission. In 1964 Chaparrals won the Sports Car Club of America’s United States Road Racing Championship (USRRC). USRRC events were much shorter events (usually 2 hours) than Sebring and there was some question if the Chaparrals could last 12 hours. To find out for himself Jim Hall shipped a car and crew to Sebring in late February and after several days of rigorous testing there and at Rattlesnake Raceway in Texas he was satisfied that the car could take anything that Sebring could throw at it. 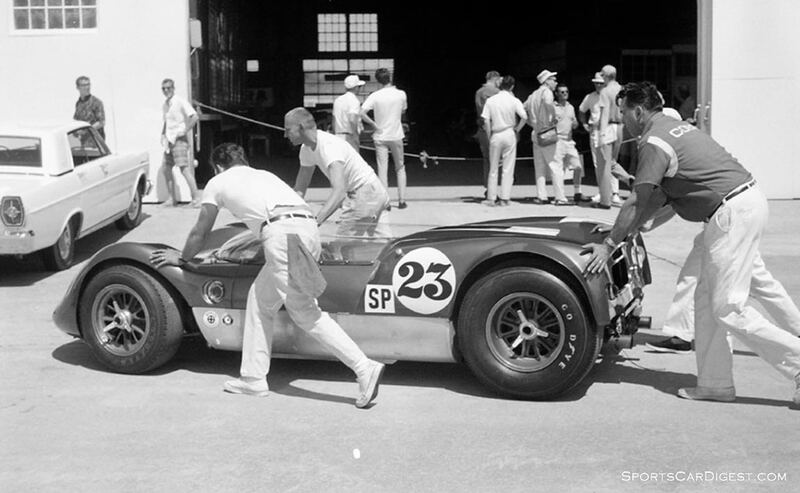 Both Ford and Ferrari knew that they were at a weight disadvantage with the much lighter (by 600 pounds) Chaparrals and if they expected to come in first overall at Sebring the “Dark Horse” Chaparrals had to fail. In 1964 the Ford program to beat Ferrari was run out of England. However their attempt to develop a prototype car that would be a Ferrari beater was a miserable failure. At the end of that year Henry Ford II turned over the GT program to Carroll Shelby who had shown great success in 1964 with his Cobra cars. 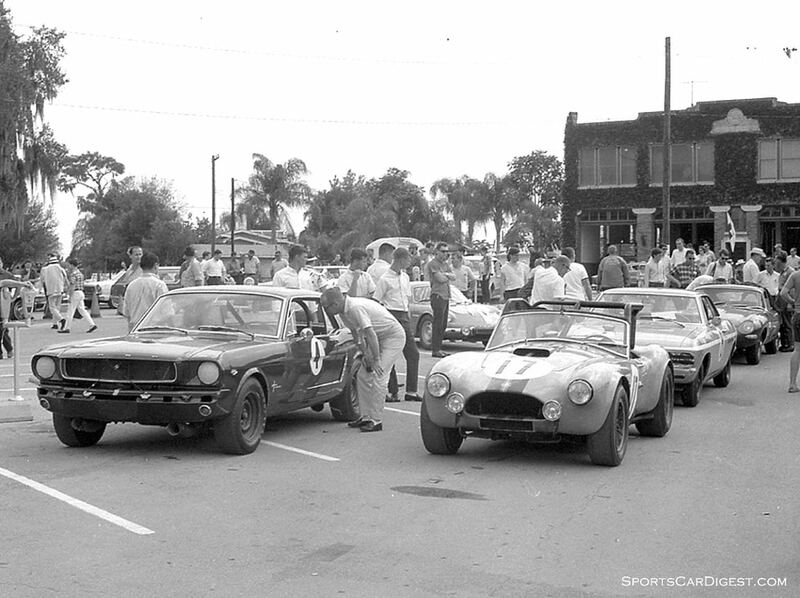 Shelby had five Cobras finish in the top ten at Sebring that year. Ford believed that Shelby knew how to win. Right out of the starting gate in 1965 a Ford powered Shelby GT40 came in first at the 2000-kilometer Daytona Continental. This was remarkable since the Shelby American organization had only two months to prepare for Daytona after Ford dumped the GT program in their lap. Ironically as Sebring celebrates the 50th anniversary of the ’65 race the temperature at the track on Friday was 93 degrees according to my auto. That almost equals the 94 degree temperature on race day in 1965. Hopefully they won’t get the deluge they did 50 years ago. Also dealing with temperatures, the photo of the hands of Carroll Shelby and his clipboard should read that he was checking tire temperatures not pressure. Thanks for another great article and wonderful photos. Thank you Lou – still my favorite piece…an extraordinary story, superlatively well told and illustrated. Thank you! Thanks for the photo update. Always tremendous, Lou ! fantastic article! It only adds to the pedigree of our car (#61 Streamlined Austin-Healey Sprite), which up till today has a hole in its floor, an option added during the race by Geoff Healey with a hammer to make sure that the pilots’feet did not get too wet. Given the 1300cc of the car it is almost a miracle that they finished 15th overall, against much mightier machines… one would almost have wished that the rain never came to a halt. Great stuff! My buddy and I made our way onto a tractor/track cleaner that was parked under the Martini Rossi bridge as the storm hit. We were able to watch from here and stay relatively dry during the storm. Sometime after the rain had stopped we were chased off of the tractor back to the spectator area… he and I still laugh about it today. Somehow we knew we had watched what would become a classic event at a classic track. We were 17 at the time. Thanks for these great memories. This race was fantastic because of the “boat show” it was transformed. I know your pics and text from Flickr, where my ID is Photomechanica. I have a question about the photo of an Alpine A110 – # 69.
Who was the drivers. At the photo you made a mistake, calling the car as a “Rat Cooper”. Great photos. Watching coverage of this race on Wide World of Sports and reading about the Nassau races in Sports Car Graphic Magazine is what got me interested in sports car racing as a kid. Loved this era because you could see prototypes and GT’s racing along with production cars like Healey’s, Triumph’s, and Volvo’s. 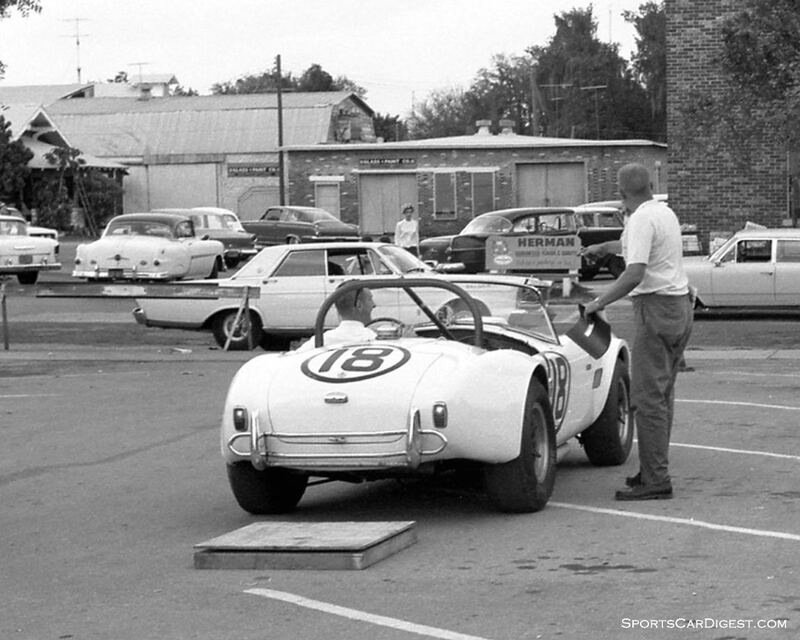 I remember the marque-owner’s pride as I heard the first reports of the works Sprite’s moving up so well in the 1965 Sebring standings, their persistence with good aerodynamics and narrow tires. Doing virtually all of my sports car racing in the Pacific Northwest, I grew to love the advantage of driving strategically in the rain. Years later, I reconstructed my list of race wins, and was not surprised that I accumulated most of my points at the now-long-gone Westwood circuit. And yes, another of the works Sebring cars sold recently on BAT.com at $172K.